I Want My Music To Follow Me. When working around the house we oftentimes want to move from room to room cleaning, organizing, resting – but we feel limited because the music is playing off our laptop or stereo system and if we leave the room we won’t be able to hear the song anymore. If it is a laptop it isn’t too much hassle to move it to a new location – but sometimes you need to go back and forth between rooms or floors quickly and it would be silly to carry the laptop dozens of times between these rooms. The standard answer is, “Go buy a Sonos. Then buy wireless speakers for each room in the house you want the music to play in.” This gets a bit pricey – and Bose and Samsung aren’t offering budget line items either. At least for me, Sonos wasn’t an option. 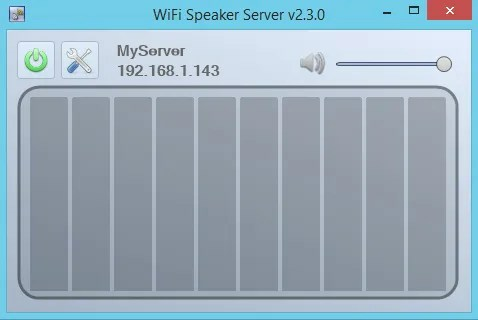 Screenshot of WiFi Speaker Server running on a Windows 8.1 machine. So what else? I’ve tried turning the music up real loud but two problems remain. First, if I enter the room where the speakers are my eardrums scream out in agony and second, at least my sound system can’t overpower the noise of a vacuum cleaner or other electric household tool that insists on making loud noises and which family members always seem to insist on using just as one is sitting down to relax and watch TV or talk on the phone. For a while I didn’t have a solution…but then my sound system (which I’d picked up at a garage sale for $10) died (due to a mischievous cat loving to eat cables) and I was waiting for my new sound system to arrive (Logitech Surround Sound Speakers Z506)…so I became creative (it isn’t that I actually needed speakers at the moment – but that I don’t like my electronics to be broken…so that when I do need/want to use it, its ready to go) and did some searching around the Google Play App store. I found a nifty little application by William Morrison called “WiFi Speaker.” I installed it on my phone and then another little app onto my laptop. With a few mouse clicks my computer was now sending the audio over WiFi to my smartphone. I turned on Spotify, put in ear buds, grabbed the vacuum, and merrily went about my way. The application is available in both free and pro versions. The pro version costs $3.99. Yes, I bought it. You can see the official website for the software (and links to download) here. There is also a helpful guide for those who might be struggling getting WiFi Speaker up and running. 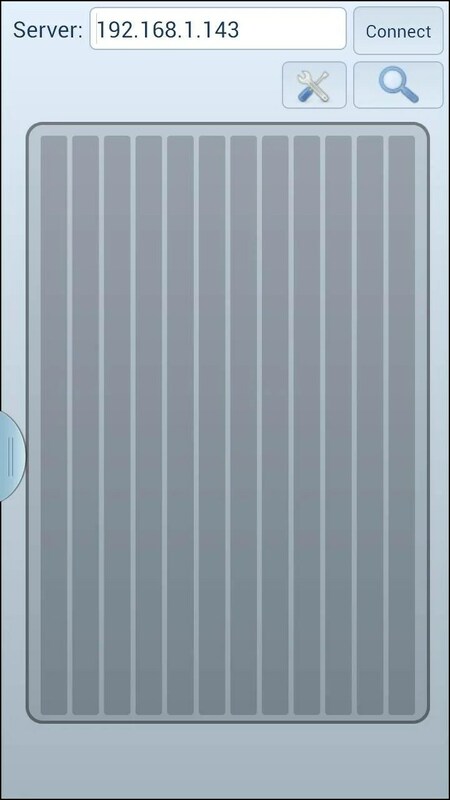 A screenshot of WiFi Speaker running on my Samsung Galaxy S3. I wondered if this could also be used to setup a smartphone (or phones) as speaker(s) for the laptop when watching a video (movie, TV, YouTube). I didn’t make any configuration changes and just started playing a video – but the mouths weren’t in sync with the conversation on the laptop. I have tried making a few configuration changes since then with bad results. Sometimes the laptop began hissing static at me, other times it gave out little bleeps that I think where supposed to be music, and finally, I couldn’t get it to work at all. What is the first thing you try when fixing a technology problem? Reboot the device. So I took my own advice and rebooted my Windows box and when everything came up, it worked just fine again. I suspect that if I had closed out the server application before making these changes on the phone and then opened it again after making the changes, the problem would not have occurred. I’m planning to shoot the developer an email letting him know about the issue and hopefully a patch can be quickly produced. I don’t use an iPhone – haven’t for years and I’m not looking back wistfully either. I know many of you still insist on Apple technology (I really don’t have a problem with Apple, I just like to goad my friends and family who are Apple fans) – so here is what I found for you (and not surprising, it is more expensive). Screenshot of Airfoil on a Mac. 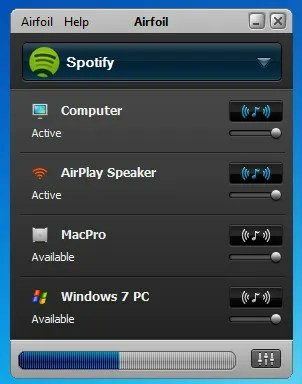 Rogue Amoeba Software has written “Airfoil for Windows” and “Airfoil for Mac” application which runs on your Windows computer. The application costs $25, you can download a free trial before purchasing. This software is installed on either your Windows or Mac computer. Don’t forget to grab the free app for your iPhone! If you do purchase this software and have the opportunity to utilize it, I’d love to be able to share some firsthand experiences about the iPhone app. Previous story Shakeology, Garden of Life, and Vanilla.